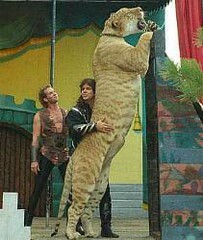 There haven't been many pictures here lately, so here is a picture of some men hugging a giant liger. That's right, liger. It's pretty much my favourite animal. It's like a lion and a tiger mixed...bred for its skills in magic.